The Sun-Mar Excel toilet is a popular option for RVers or those living off-the-grid. This particular model does not use water or electricity, but remains just as comfortable as a toilet that you would use at home or “in civilization”. The Sun-Mar Excel is a composting toilet that many people feel is a worthy investment for anyone who wants to venture out into the unknown. To find out why you should take a look at some of the features of this toilet in our Sun-Mar Excel toilet review. The Excel is a non-electric model toilet. You do not need power or water to use it, but it is still 100% non-polluting. This is because it uses a variable diameter bio-drum and a recessed handle to process compost. In short, it is a self-contained toilet that does not allow odors to seep out while it converts human waste into a safe, fertilizing soil. It is designed to be used as a primary toilet. It can hold the waste of 2-3 people in a residential setting as a primary toilet or it can be used by a group of people camping in the woods for an entire weekend without being dumped. The only thing that you have to provide for this toilet is the drain hole, even if you plan to use it as a compost. With the drain attached, you still will not need to add water to the unit. All other necessities for it are included with your purchase. This includes a venting kit to ensure that odor is not something you will ever have to deal with. This is why it meets all NSF/ANSI standards. This low profile unit complements any bathroom that you want to put it inside of. It works in areas that have no plumbing set up for a regular toilet. It works when you are out camping and in rustic cabins that have no power or water lines. It is ideal for boating and all other outdoor activities. To further enhance its usability, it is 33 x 22.5 x32 inches in size and weighs 90 pounds. Where and what will you use it for? This toilet proves that you cannot be perfect for everyone. It seems that people either love it or hate it. Some of the biggest issues that people have with it include that it is poorly made and kind of smelly during the hot summer months. They say that not all of the waste will go down into the tank like it is supposed to and that it makes a mess when you empty it. Others counter these things by stating that it is not easy to figure out how to use it properly, but if you do, you will have the best ﻿compo﻿﻿﻿﻿sting﻿ toilet. Some reviewers do recommend that you drain the waste into a cedar filled hole under the toilet because it will take longer for it to compost in the toilet tank then you will want to wait. Some owners have used it for many years and still love the toilet. They do recommend that you purchase a vent fan to ensure that you do not have to deal with odor or flies. They also add chemicals to keep the smell away, especially during the summer months. Is the Sun-Mar Excel Worth It? 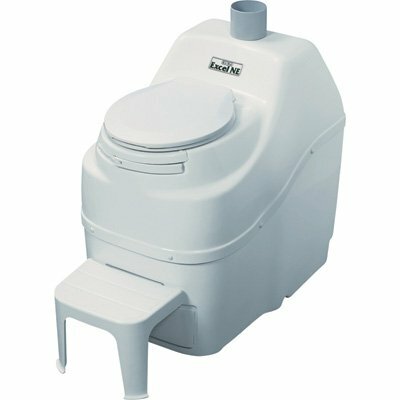 The Sun-Mar Excel is not a composting toilet that will work for everyone. However, if you are going to visit a cabin in the woods that has an outhouse for people to use rather than an actual flushing toilet, you may enjoy going to the bathroom a little more with it. It is designed to give you a place to “go” when you are not in your own home where there are flushable toilets. If you spend time living off the grid, you may enjoy this toilet over the outhouse, but you have to face the fact that it is a composting toilet. Nothing more, nothing less. It does what it is supposed to do.